Y'all already know what it is. Top Dawg Entertainment supergroup Black Hippy are by far the most promising rap clique to emerge in recent memory, consisting of lyrical heavyweights Jay Rock, Ab-Soul, ScHoolboy Q and Kendrick Lamar. Most recently, they released what was arguably the best remix of Rocko's 2013 single "U.O.E.N.O. ", were granted their own cypher at the 2013 BET Hip-Hop Awards and headlined Power 106 LA's 2013 Cali Christmas concert at the Honda centre in Anaheim, which featured a guest appearance from Diddy himself. Stay tuned for the further adventures of Black Hippy, but don't count on an album any time soon - the individuals are much too busy with their respective solo efforts. Black Hippy formed like Voltron in 2009. Forming a group was ScHoolboy Q's idea, which came about due to his tendency to slack. Tech N9ne has described them as "The New N.W.A." Kendrick Lamar was the first member of the group to release a major label album, that being good kid, m.A.A.d city (2012). 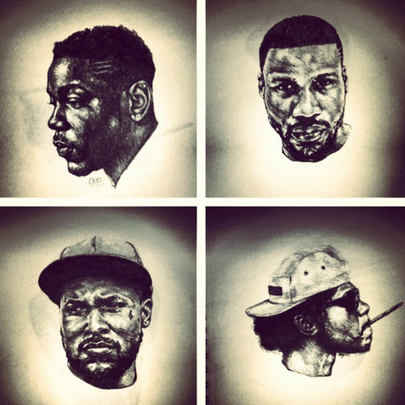 Black Hippy have yet to drop a full-length project as a unit. Who Would Win The World Cup Of Rap? Quiz: Which TDE Rapper Are You? Ab-Soul Wants Dr. Dre To Let Black Hippy Make "Detox"